John Macey was another Wurzel with a jazz background, a well-respected upright acoustic bass player in the Bristol jazz scene. Along with tuba player Brian Walker, he had played in Acker Bilk's Paramount Jazz Band at Bristol's Crown and Dove pub; although in jazz circles he was known as Johnny Macey. On one occasion he was also credited by Adge as "The Man who put the 'Sod' in Chipping Sodbury", which contradicts Adge's earlier assertion that that man was Reg Quantrill! We have little information about what John actually did prior to joining the joining Adge; but a rare 1950s British jazz revivalist EP 'New Orleans Jam Sessions Volume 1' by acclaimed jazz trumpeter Bob Wallis (of the Storyville Jazzmen) shows Johnny Macey playing alongside the likes of Acker Bilk and a young Ginger Baker (who went on to be part of Sixties rock trio Cream). He appears on Acker Bilk's Vintage Acker Bilk CD which was recorded between July and December 1957 for Doug Dobell's '77 Label. He also played with the Avon Cities Jazz Band - although as this band has a history running from 1949 to the present day, and involved the good and the great of Bristol jazz in its line-up - perhaps it would be more surprising if he had not played with them. I have no idea whether this was before or after his time as a Wurzel. 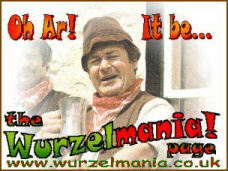 Fellow Wurzel Tony Baylis was a member of the band, although not at the same time. Adge Cutler somehow managed to entice the John and Brian to become the rhythm section of the newly formed Wurzels in 1966, and both were involved in the legendary Royal Oak recording of the debut album. Although Brian left soon afterwards, John remained with the band until after the release of their follow-up album in 1968. On the second album where all band members were asked to contribute their own compositions, John wrote the song Sniff Up Thy Snuff and, with Reg Quantrill, Drunk Again. After the release of Adge Cutler's Family Album, John left the Wurzels and returned to the Bristol jazz scene.